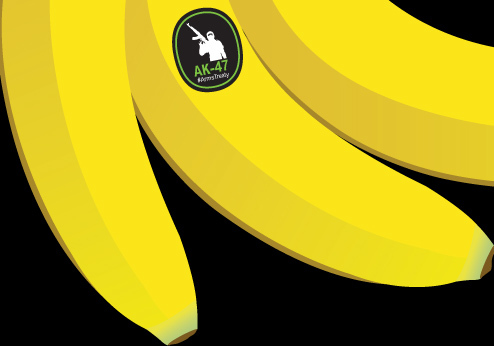 What’s the deal with bananas and the global arms trade? Are there more international laws on the trade of bananas than conventional weapons, like AK-47s? The short answer is astonishingly, yes. The global trade in bananas or banana plants is governed by at least three binding global agreements and the non-binding, though strictly adhered to, Codex food code. The arms trade is not governed by any binding global agreements. 1) Bananas: As agricultural products, the trade of bananas is governed by the World Trade Organization/Uruguay Round Agreement on Agriculture. The goal of this agreement is to reform trade in the sector and to make policies more market-oriented and improve the predictability of global pricing. 2) Bananas also fall under the Agreement on the Application of Sanitary and Phytosanitary Measures (the “SPS Agreement”). This Agreement sets out the basic rules for food safety and animal and plant health standards. AK-47s: The arms trade is not governed by any legally-binding agreement covering all countries. While there are some international arms trade agreements, no global agreement is binding and most agreements are regional in scope and limited by significant gaps in coverage. For example, over 40 states are not part of any regional organization that maintains an arms trade control instrument. 3) Banana safety standards are set and governed on a voluntary basis by the international food code. The Codex Alimentarius contains recommendations for voluntary application but serves in many cases as a basis for national legislation and sets the standards for the SPS Agreement. While not technically binding, international commerce on food strictly adheres to the standards set out in the Codex. AK-47s: There are no global standards on the arms trade in regard to when a particular arms transfer is or is not appropriate. Out of a total 154 countries that have reported, only 73 countries said they have basic controls on the export of AK-47s and other small arms. 4) Banana plants, as opposed to bananas, are also regulated by an international convention: the International Plant Protection Convention which aims to protect cultivated and wild plants by preventing the introduction and spread of pests. The fact that the world’s governments have come together to ensure the banana trade is governed by some basic rules and have not done so on the arms trade is a great concern. It is beyond ridiculous that governments and corporations are far more constrained by international law when trading bananas than when trading arms. I have to admit that while the comparison between the amount of international law governing bananas as opposed to arms shows how absurd it is that there are no controls on the arms trade, there are significant differences between global commerce on each that need to be raised. The goals of international agreements covering bananas are to reduce trade barriers, establish uniform enforcement of contracts, and prevent contamination of the global food supply. The primary goal of the a potential Arms Trade Treaty is to prevent conventional weapons from making their way into the hands of human rights abusers and from being used to perpetuate conflicts and undermine development. It is thus not surprising that because the goals are different the means for addressing the issue are different. Up to now, the major arms exporting states have preferred to forgo international agreements and instead address the process of making arms deals and limiting arms transfers to dangerous end-users through domestic law and regional agreements. Notwithstanding these differences, the reluctance by countries to add global regulations on the arms trade has resulted in a patchwork international regulatory system where some states have strong controls and others have next to nothing. The patchwork of laws allows irresponsible dealers and governments to operate in the black holes of the international regulatory system and supply weapons to entities that would use them to commit war crimes and human rights abuse with impunity. If governments can get together to ensure food is safe and the price of bananas is free from protectionist policies, they should be able to come together and forge an Arms Trade Treaty that would save lives and protect livelihoods. The Ak-47’s are not grown. Bananas are a danger to people walking on streets around the world as they are very likely to slip and fall….the weapons require a human to fire them, any monkey can toss a banana. Pingback: The Internationalist » The Arms Trade Treaty: Time to Celebrate? Pingback: La peau de banane, plus dangereuse qu'un AK47 ? - Le savais-tu ? Why is the Obama administration opposing global regulation of bullets in an ATT?